Winmate rolls out a new cost effective and high performance industrial Box PC, which is the best choice for Windows Vista, Multiple Display and Industrial Applications. 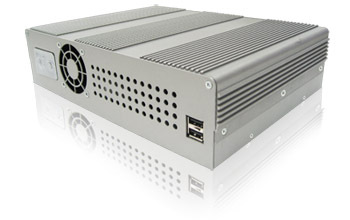 The new A270 BOX PC, is integrated with AMD socket AM2 Sempron 45W Processor and AMD M690G / SB600 Chipset. The All-in-one compact system support Dual Giga Ethernet ports, Dual independent display with dual-link DVI and CRT outputs and fully support ACPI states S1, S3, S4 and S5. The A270 series motherboard is integrated with the ATI Radeon X1250 graphics engine which provides 3D rendering power, needed for good performance of Windows Vista or other most demanding 3D and Graphic performance applications. Moreover, the high graphic performance empowers shared memory of up to 256MB, VGA output maximum resolution is supported up to 2048 x 1536@ 85Hz and 30 bit dual-link support for DVI . It delivers the best Windows Vista experience from any of our integrated graphics and core logic products within the Winmate product range. The A270 SBC power mode allows customers to select the most suitable power mode for their unique applications.